Weaver Leather Mosaic Non-Adjustable Halter, Rich jewel tones pair with antique nickel plated hardware for a current, yet understated, look. Constructed using the finest nylon, this halter comes in a color palette that brings to mind an intricate mosaic of color and texture. 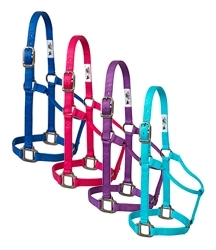 Beautiful on a wide range of horses, this halter features a comfortable rolled throat, oblong buckle holes, box-stitching at stress points, heat-sealed edges and true-to-fit sizing. 1" small horse size.